From the signage outside you would think you were entering an auto body shop, but inside Bar Matchless you’ll discover a cool indie rock bar where the locals hang out and emerging bands from all over New York play. 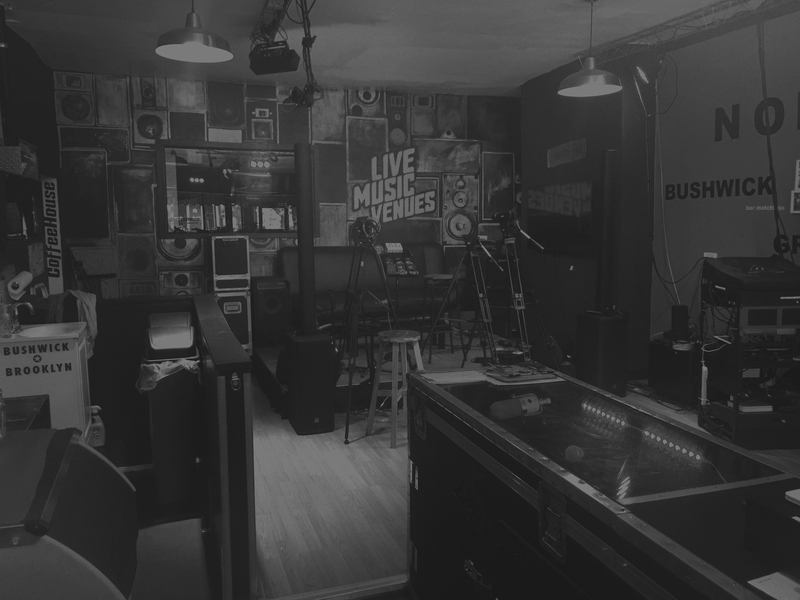 Bar Matchless is a live music venue that supports the Brooklyn music scene. On any given night you can wander in off the streets of Greenpoint to check out a live show in the back room. The stage is high, allowing you to see the band performing wherever you’re standing in the narrow room. A small bar is conveniently located in the back corner. Upon entering the front bar you’re enveloped in a chill atmosphere with low lighting and comfy red booths. The DJ mixes it up on the turntables and bodies responds in rhythm. If you need fresh air after dancing, step outside onto the patio and cool down. Additional activities include: working your way down the 16-tap beer list during Tuesdays’ two-for-one drink special, or rocking out during “Heavy Metal Parking Lot Karaoke” on Wednesday nights. Bar Matchless is a great neighborhood place to grab a few drinks and a casual bite. The full kitchen offers a variety of dishes and is open until 3 a.m. The newly re-opened Knitting Factory in Williamsburg is a big change from its previous incarnations in Manhattan. Still extremely band friendly, broad in its tastes, and partial to quality acts, this club is sleeker with advanced technical equipment in the live room and a separate bar area with additional programming. In Williamsburg, the club is imbedded in a community by offering all-age activities and collaborating with public organizations. There's a hint of possible new order for music venues here with a heavier emphasis placed on a comfortable and larger bar area, which allows for a dynamic social atmosphere. The front bar has two large TV monitors geared toward sporting events programming. A small stage for DJs, comedians, poetry readings, karaoke and small acoustic set-ups, is discreetly carved into the sidewall. Just as you're wondering where the music room is, a superb surprise reveals itself. Behind the bar, where you might expect to see a blank wall, or mirrored reflections of liquor bottles, there stands a gloriously large window to the main music venue. Knitting Factory has a long history and an ever-expanding presence today. It opened on Houston Street in 1987, later moving to Leonard Street, and finally re-locating in 2009 to Williamsburg. Around 2005, the club invested in several clubs in northwest America, only to buy them outright a year later, which expanded the Knitting Factory into an entertainment company. The company is currently re-igniting its record division, growing as a management company, streaming live shows online, working on a live TV show, and writing a book. Pete’s Candy Store is an affable bar and live music room. The bar is small, and maze-like. Discovering the different rooms and hallways can recall memories of exploring an old house as a kid. The space is made up of real wood wainscoting, mellow-yellow walls and old-fashioned pieces—the vintage, red refrigerator behind the bar was installed by the strength of six men. There is a beautiful back patio and garden, and the kitchen sells grilled ciabatta sandwiches. “The driving motive behind the performance room was to make the performers feel good. It’s intimate. People that come to see a special musician and get a decent seat usually have a memorable experience,” the owner, Andy, says. A long and narrow room, with no cover, it is a good idea to arrive early to get a good seat. Latecomers often sit on the floor or stand in the back to absorb a performance. Successful musicians, such as Norah Jones, still play the venue often, but these shows are never posted or even leaked. Andy sums up the ethos of these secret shows best: “It’s a wonderful experience for those who just happen to be there—an intimate show that everyone enjoys. It gives freedom for the artist to mess around, workshop and experiment in a live setting, while they are ‘hiding from the public at large.’” The music style at Pete’s Candy Store has been consistently wide open to anything that musically fits the small space, which is perfectly suited for singer-songwriters, alternative and antifolk musicians, and experimental performers, as well as a haven for side projects of bigger rock bands. Devendra Banhart, Will Oldham from the Palace Brothers, Joanna Newsom, Akron/Family, Sufjan Stevens, the Wainwrights—Loudon, Martha and Rufus, Deer Tick and Beth Orton have all graced the stage. Pete’s Candy Store serviced the local sweet-toothed in Williamsburg from the early 1920s all the way to the ’70s. The business then changed to a greasy spoon and most recently a cover diner for a mob-operated business that was more often closed than open. All the time, the old-fashioned ‘Pete’s Candy Store’ sign hung above the entrance. In spring of 1999, Andy took over the space. He fixed up portions that had fallen into disrepair, and added and knocked out walls and doorways to improve the atmosphere. He kept the storefront intact, and after much thought kept the original name—no other name suited the place. The news of a music venue at Pete’s Candy Store spread quickly. It was the first nightly live music venue in Williamsburg and the discovery was significant for people, even though it was off the beaten track. An out-of-the-way music venue at that time was a phenomenon and it became an exciting destination. The energy at night was stimulating, opening everyone’s senses. Andy recalls that, “Those memories are special to those who were around during the hay-day of the venue’s first few years.” Non-music-oriented locals express their sentiments about Pete’s Candy Store as well. Over the years, many folks have enlightened Andy about their personal experiences at the candy store. Neighborhood ladies spoke of their employment there in the ’70s and standing on ladders to paint the words, ‘Pete’s Candy Store.’ Others remember doing their homework there after school when they were kids, and folks who have moved away are amazed to hear the store is still there, except it is a bar and music venue—adult candy. Union Pool is a long-time popular, neighborhood bar that buzzes with humanity without feeling crowded. Small-looking from its exterior, it actually provides several areas for hanging out, a beautiful music room, and well-thought-out music scheduling. The stage is an attractive jewel-box style theater, fronted by a large dance floor of which people do not hesitate to take advantage. Union Pool’s other spaces include: a main bar with aqua-colored walls and a DJ booth, and the patio area, which is outfitted with benches, lounge chairs and a little botanical pool and water fountain. A taco truck from which tasty midnight snacks are dispensed sells amazing tamales and more. Union Pool has always nurtured community and band relations. Its long-time employees and bartenders are also artists and musicians who promote and connect the venue with great musicians. Bands at Union Pool are fed by the house, and the cover at the music room’s door and band merchandise sales go to the musicians and sound person. 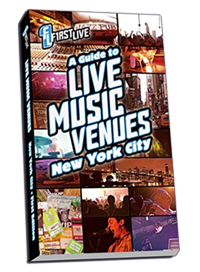 Maintaining these standards is important to Union Pool management under the philosophy: “The band has a hard enough time as it is.” The room draws bands who are on the verge of playing larger Brooklyn and Manhattan rooms; acoustic musicians, indie bands, touring national acts, secret shows, private one-offs and tapings. Well-known bands that have played at Union Pool are Cat Power and TV on the Radio. Shows at Union Pool are often at-capacity, signaling one of the final, intimate-sized shows for the band on its way up. The venue does not try to follow trends, but strives to provide stimulating, original, quality music. Union Pool offers music five to seven nights a week. Reverend Vince Anderson plays two sets for his devotees at 11 p.m. every Monday. Free shows are usually offered every other Tuesday. On Friday and Saturday nights DJs play after the bands—there are occasional DJ parties as well; and summer-time brings Sunday evening shows, as well as free Saturday afternoon shows on the patio, from 3 – 8 p.m. Back in the ’70s, Union Pool was a concrete warehouse for pool and exterminator supplies. The building went dormant for 15 years, until it opened as a bar in 2000. Music came to Union Pool still a few years later. On the outskirts of the Bedford Avenue art scene at that time, the venue’s first shows were raw and punk in nature, and could only offer performers a ramshackle stage and PA system. Around 2006, the space was upgraded, adding a back patio, the music room’s bar and a proper sound system. The venue began to focus on low-key, local country and folk music, with the occasional trendy show brought in by outside promoters, such as Todd P. When current manager, Sage, came on board he expanded the music program beyond two or three shows a week. The venue also experimented with more music styles, and built on what worked best sonically within the space. In the spring of 2010, the music room was sound-proofed to heighten sound quality and counter noise complaints from neighbors. The Brooklyn Queens Expressway runs right past the venue, but the traffic noise does nothing to disrupt enjoyment of the music—it actually helps buffer the noise impact, as well as provide an easy access for patrons. As Williamsburg has developed, Union Pool has become the epicenter of the area. It is between two major train stops and train lines and in a thriving young, artistic neighborhood.